← Seeing — it’s a good thing! For some reason, Sunday mornings always seem like a good time to peruse the Homes for Sale sections of the paper and internet. This is one passtime I love to do. I save houses I like and the realtors will email me with possible homes for sale nearby… I feel like I’ve been on a trip by the time I’m done looking. Of course, we are in no position to buy a house, or to sell our house, now. But I like to dream. Just after we were married, we had planned on buying Paul’s folks’ house in Marblehead. Above, the folks’ house now, looking a lot different from back then. Above, not the best view but you can see the house on our Wedding Day in 1986 – we got married there. They were going to sell it to us “cheap” for about $200,000 – the price cut would mean that Paul would have gotten his inheritance by not having to pay full market price. Well, we married in May and we moved right into the house. His folks had an air-stream trailer and were retired, so they motored all over the country in that thing and lived in Florida in it in the wintertime. We lived at their house in preparation for buying it from them. We lived there for about 4 or 5 months. When they returned they pulled their airstream into the long driveway and plugged into the house for a while. One night they called us into the trailer to have a chat. The gist of the matter was that they had spoken with their accountant and he advised them NOT to sell the house at a reduced price and that they needed the full market value of the house to use for retirement purposes. So we had to look for a new home. We were crushed. Paul loved that place as his father and grandfather had built it with their own hands. So we started the house search right away. We looked at many homes in Marblehead, which was where we planned to live since Paul lobsters out of Marblehead Harbor and it is our home-town. Every home we looked at had something Paul didn’t like. I loved ALL of them! It was a dream-come-true for me just to be married to Paul at that point but to be house-hunting, something I never thought I’d be doing in this lifetime, was an even bigger dream. So we schlepped around town at all the homes in our price range, which back then was around $200,000 — not too shabby in the 1980’s. Then we found this house on Jersey Street. Oh how I loved that house! It was only one street over from where I grew up, on Evans Road. It was only a few houses down the street from where my best friend, Carol, lived while I was growing up. I practically grew up in this neighborhood, we played all around here as kids. It was perfect, in my mind. As you can see by looking at the current photos of this house (click on the photo above for the listing and photos of it), its been renovated but it was still great when we looked at it. We knew the yard was a little (a lot) small for us as we had lobster traps to store in the wintertime and we had two great Pyrenees dogs living with us! But we made allowances and decided we’d make an offer on it. We both loved the place. A historic house, to boot! The owners were moving to California and were “motivated” to sell, so our realtor told us. I can’t remember the exact figures all these years later, but we offered something like $180 to $185,000 for it. They were asking a little more than that, but they came down a bit and we went up a bit. We ended up $2,000 off… if Paul had agreed to go up another $2,000, we would be living there still to this day. But he was not budging and the owners would not budge. I was furious about this! $2,000? I could not convince Paul to go up. We lost the house. Back to the drawing board. One day during my lunch hour, I saw a small personal ad for a house for sale in a neighborhood not far from where I worked, in Salem but near the end of Marblehead too. It was what was to become Crow Cottage. The rest is history. I showed it to Paul, he said he could make an offer on that house. It had a huge yard front and back, plenty of room for all his “stuff” and the dogs and us. 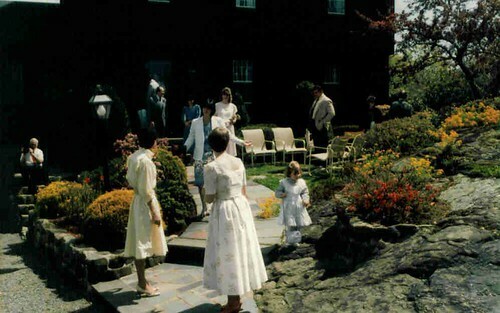 We closed on the house in November of 1986 and moved in at the end of January 1987. We’ve been here ever since. 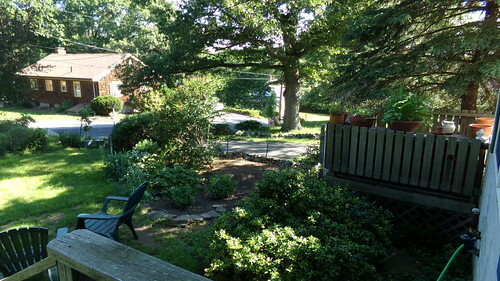 So we took out all the burning bushes AND the two large forsythia bushes… I can see down the street now! 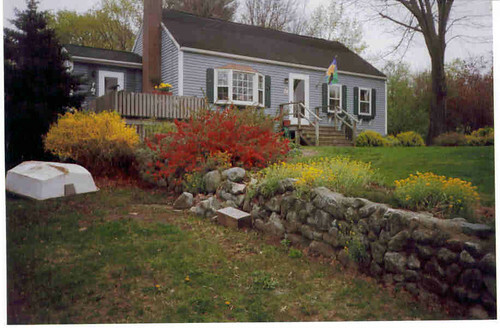 My plan is to plant rosebushes all along that back perimeter of the corner garden, at the top of that stone wall. 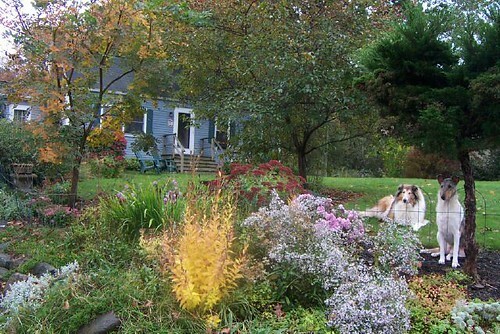 I’m hoping to find some low-maintenance rose bushes that will flower all summer long. I need some color out there! That’s all for now. See you again soon! I truly enjoy looking at real estate listings and daydreaming about various homes, or things I want to do with our home. I was actually looking through the MLS listings last night, though I was looking at waterfront properties and not regular homes. We actually consider our house to be our savings for retirement. After some research we’ve pretty much decided that we’ll improve this house for about 10 years and then we’ll sell it and use the money to supplement our retirement. We’d like to travel some and we’re not going to want the upkeep on a house. Payments aren’t so bad with housing, it’s the repairs that can land you in the poor house. So, while I look and dream, when I stop dreaming I realize this is the last house we’ll actually own and after this we’ll be renters – preferably spending sometime in a waterfront home and other times in places like the the Caribbean islands (hopefully on a cruise ship). I know Eric! Snooping is so much fun! I am amazed at the information that is at our fingertips. There is no such thing as privacy any more. I was reading that the new google glasses now can detect/record when you just glance at something… and people can know about it! I read a little book once about a guy who, all of a sudden, would have a little cartoon-type bubble above his head whenever he thought thoughts… and so everyone knew what he was thinking! It drove him mental! I don’t think that is very far off! Yes, real estate taxes can be dreadful. I mentioned Rochester NY and you can find cheap houses in nice neighborhoods there, but you’d need to pay sky high real estate taxes forever. Out in the country where we are now the taxes aren’t bad. …(a lot like the one in my blog today) that had one bathroom with a bathtub, no shower, and it was upstairs, no powder room or loo on the first floor level. We survived ok. I didn’t take a real shower until I moved into my first apartment away from home when I was 18 – in Boston. Now the couples would die rather than cook in a kitchen that didn’t have stainless steel everything and granite countertops! Oh, puleeze! We bought our house in 1976, for $16,900, 925sq. ft. and that may include the garage, I don’t remember. Lot size is about 1/4 acre and that is mostly back yard. It’s paid for. Then a year ago we decided daughter should have a house and her brother’s insurance bought it. 1,000+ sq. feet but only 2 bedroom. I was glad when we could quit looking. Our limit was $76,000 if I recall and that doesn’t get you a lot of new here. Considering neighborhoods HoA’s and all that isn’t really our cup of tea. Living in a house that is paid off is a very good reason for staying put. We paid our house off twice. One it took about 7 years I think (Paul had cashed in a lot of his stocks so we only had to take out a loan for about $40,000 and paid the rest in cash). Then, once we owned the house outright for a few years, Paul’s lobster boat was smashed to smithereens in a storm so he had to borrow about $35,000 to buy a new boat using our home equity loan. Once he paid that off, we’ve been homeowners clear and free. All except for that little thing called real estate taxes that pop up each quarter. I think they should do away with those things altogether. I’m like Mary, I love looking at homes for sale. It’s my passion actually. I once wanted to be an interior designer and spent money to take a correspondence course in it, but never finished it. Stupid. I love that they have photos of the rooms of the homes for sale… it’s better than magazines! Browsing real estate listings. Mary does that too. What I say to her is “Why bother? We can’t move. You’ll just depress yourself.” But she claims she enjoys looking. It’s entertaining. Well, the Internet is wonderful for real estate window shopping. It is remarkable how real estate prices have skyrocketed in many areas. The house I had in Rochester. NY, hasn’t appreciated much since the eighties though because house prices in that city have basically been falling for decades so I didn’t lose any potential profit in leaving. I loved the location, however. A nice suburban-type street, only two blocks from a beautiful park along the river, and two blocks in the other direction to a shopping center. Our present (and future) house is actually a summer cottage and pretty tough to live in during the depths of the winter. It was selected for affordability after a series of unfortunate financial events including my getting robbed blind during my divorce and then losing my job. It is paid off and we’re not leaving. Alive that is. Well, when we were looking for our house, back in 1986, the prices were OK. There were a lot available in our range… but today, you could not find a tumble-down shack for $200,000 over in Marblehead. A normal size and neat home over there is going for over $1 million and a lot even higher… in the multi-millions. Salem is really more our speed! I never understand real estate prices and never did. I read the weekly news and see that houses are more and more expensive, and more and more agents are in the Million Dollar Club. I see that some agents are selling property among themselves; I wonder a lot about that. I watched the value of my house — bought in 1970 — go up…and my husband didn’t want to sell. And I watched the value go back down and just have to hope that I shall have enough to support me elsewhere. Ah, roads not taken. It’s always interesting to speculate, isn’t it?